Join Archaeologist Dirk Marcucci for a visit to the Levsen site, a rock shelter where Paul Sagers found archaeological remains. The hike is about 2.5 miles and rugged. Wear appropriate footwear and dress for the weather. You can meet at the Hurstville Center at 8:30 a.m. to carpool or meet at Buzzard Ridge Wildlife Refuge at the parking lot at the E17 Access, Monmouth (Map coordinates: 42.159627, -90.867420). Call 563-652-3783 for more info. 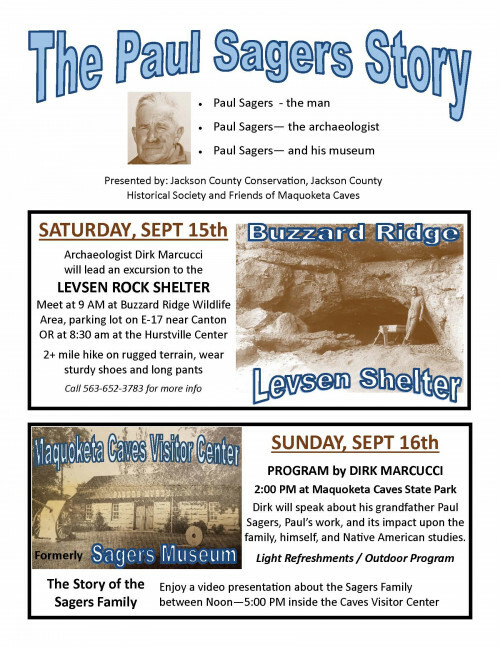 This event is presented by: Jackson County Conservation, Jackson County Historical Society, and Friends of the Maquoketa Caves.